Right around the time Kabam was launching its Marvel Contest of Champions mobile fighting game in the West, the company decided to bring it to China as well. After all, it is the single largest market for games in the world, having recently surpassed the United States according to Newzoo. At first Kabam did what most Western game makers do when looking to crack the Chinese market: it found a local publisher to handle the heavy lifting, announcing a partnership with Longtu Game. But somewhere along the way, the plan--and the Chinese market itself--shifted. As Kabam COO Kent Wakeford explained, Apple and iOS started to gain traction in the country, and the company was hearing from developers of "higher end" mobile games that nearly half of their revenues were coming from the App Store. "That was a very dramatic shift from 12 months prior, where we heard that 80-90 percent of revenue was coming from Android stores," Wakeford said. While a Kabam-published Android launch of the game in China remained out of reach, getting it on the App Store seemed comparatively doable, and the extra work that went into it would be an investment, a pipeline for future Kabam games to find their way into China through self-publishing. Kabam put together a team of 35 people working on the project out of Beijing, with a number of time-consuming hurdles to clear. "Characters like Black Widow become super popular because she has a different type of skill set than Captain America or Iron Man"
There were the regulatory requirements with licenses from two different ministries to line up. They needed to recreate their hosting infrastructure with a Chinese partner, in this case Amazon China. That alone took six months, and Wakeford said proved to be more complicated than initially expected. The game had to be translated and localized for a new audience that had some significantly different behavior patterns from their Western counterparts. "We had anticipated that some of the characters in the Marvel Universe, especially those associated with some of the big films in China, would be the most popular, whether it's Iron Man or Spider-Man," Wakeford said. "But what we found is that gamers in China are really interested in characters that have super special powers [from a gameplay functionality perspective]. So not necessarily gravitating toward the best IP or the best characters they know, but toward characters that have really interesting and differentiated powers. So characters like Black Widow become super popular because she has a different type of skill set than Captain America or Iron Man." Not pictured: Characters the Chinese market wants to play. 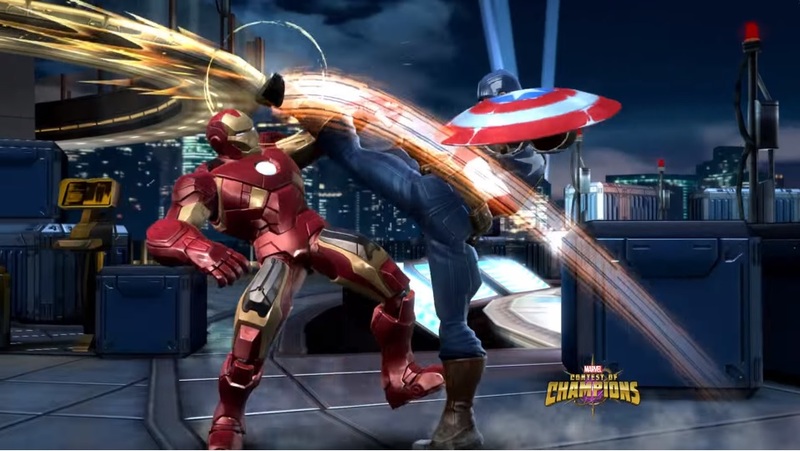 While that will help shape how new characters in the game are designed in the future, Kabam's localization involved some significant alterations to the existing game as well. Wakeford said that the company wanted to add additional features to the game that Chinese players have become accustomed to from other free-to-play games, so they added a new gear system that lets players tailor their characters' stats, and a new option that lets players skip the fighting game's actual fights. "Players in China like to progress a lot faster," Wakeford explained. "They play, they play hard, they want to progress. So we created a quickfight system where you can autoplay the fighting, which in Western markets is one of the funnest aspects of the game, but you can autofight to grind through it a lot faster and get all the loot drops and get to the progression a lot faster. It's a lot more focus on the metagame loops than some of the gameplay. "It's really understanding the Chinese consumer, understanding that they are in many ways more sophisticated when it comes to free-to-play game systems than Western consumers. There's a much deeper acceptance of the concept of pay-to-win, and that there is an expectation, especially by VIPs in the game, that VIPs are treated in a very special way. And that's in everything from what they get in the game to the customer service, and really making sure there's a special 'white glove' treatment for the VIPs in the game." Kabam published Marvel Contest of Champions in China on the App Store under the name Man Wei Ge Dou: Guan Jun Zhi Zheng on May 5. It quickly topped the most downloaded charts on iPhone and iPad, and is nearing 2 million installs. Part of that early success is due to the localization of the game, but part is also due to the localization of the marketing. "Going into the market, we didn't really have a good sense of if we could scale this, if we could spend marketing the same way we do in more Western markets"
"China's a really different market when it comes to the ad ecosystem, but we really treat it the same way," Wakeford said. "We put a team on the ground in China. We developed relationships with 20 of the largest ad networks and different [service providers] in China, and we really looked at understanding performance marketing in a way similar to Western markets, where you deploy a dollar and you can look at what the cost per install is, what the lifetime value of those users is, and you can calculate your return on investment... Going into the market, we didn't really have a good sense of if we could scale this, if we could spend marketing the same way we do in more Western markets. And what we were able to do through a lot of hard work by our marketing team was really kind of crack the code on performance marketing in China." One specific difference in the market is the prevalence of texting service WeChat, which Wakeford described as "incredibly powerful." "What we learned is the idea of rank pushes is something prevalent within China," Wakeford said. "And it can happen many different ways, but one of the ways we found is marketing on WeChat with a strong, one-day push can drive your download rankings on the charts with very dramatic shifts. So the power of a marketing program on WeChat or any kind of tie to WeChat can push people to the top of the rankings... You don't have something similar like that in the Western markets." Perhaps surprisingly, Kabam is making its push into China without much hands-on assistance from the country's web giant Alibaba. In 2014, Alibaba invested $120 million in the company as part of a "strategic collaboration" to publish Kabam titles across China. "When they made the investment, they had a vision for their gaming strategy, and that strategy has shifted," Wakeford said. "So they are not as involved with us on a day-to-day basis. That being said, they are fully supportive of our efforts to go into China." Now the task for Kabam is to keep Man Wei Ge Dou: Guan Jun Zhi Zheng rolling, to grow the audience and fine-tune the monetization. But regardless of how it performs from here on out, the game is already a success on one level. "The whole idea for us was to be able to create the infrastructure to be able to bring all of our future products into the market and be able to support them with marketing, hosting, and all the technology we need to run them at best-in-class standards," Wakeford said, adding, "China is the largest mobile gaming market in the world, surpassing the US. For us, we are a mobile company and it's important for us to have an infrastructure that allows us to be truly global. Being in China is a critical element of that strategy." Bravo! Another western developer discovered this market's golden core - Chinese gamers (giving money is no issue) are more than happy to beat opponents with paid advantages. We have a nick name for those kind of gamers here - RMB Player - RMB means Chinese currency Yuan. Of cause, all these have to do with cultural differences, and how society is built on in China.